May 26 – This was a great place, we took the back road into the village and the vehicles went around on the main highway. The backroad was blocked off due to flooding. When we got there we didn’t know what was going to happen since we were supposed to go to someone’s place, but the Chief arrived and wanted us to stay there in the gym and everything was taken care of. All of the community came together to feed us and there was plenty of delicious food. They even presented some traditional songs and dance. After they finished we offered some songs and Mexica dance as well, including me? The community was great and we appreciated all of the positive energy everyone gave us. 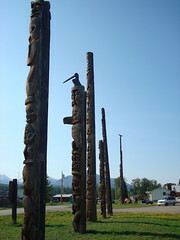 The totem poles were also amazing.